03.18.08 The Scholastic Team State Chess Championship took place at the University of Maine, Orono on Saturday, March 15th. 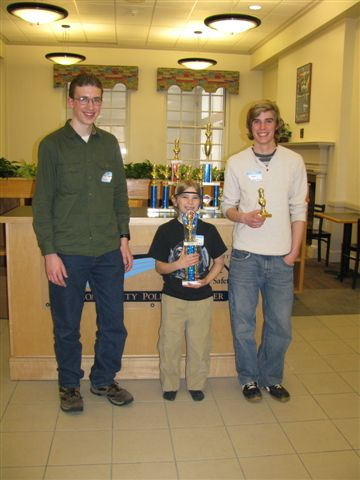 The largest chess event of the year in Maine by far, the team championship drew players from across the state to compete for state titles in High School (K-12), Junior High (K-8), Elementary (K-6) and Primary (K-3) sections. Here's the gigantic illustrated report with video impressions. We apologize for the delay in getting this report up and hope it was worth the wait. This critical position occured in the game Kurt Eyerer (John Bapst Memorial High School) vs. Mitchell Jameson (Bangor High School) and was a turning point in the championship round. Jameson managed to queen the c-pawn and win this game which tied the match 2-2 with only the game Fritz Eyerer (Bapst) vs. Henry Chai (Bangor) remaining. After an extremely close game, the position in Eyerer - Chai rarefied to pawns and rooks. Eyerer offered the draw which Chai accepted resulting in Bapst and Bangor sharing the state high school championship title. Thanks to Alba Briggs, Dan Fishbein, Phil Lowell, Tom Sandford and Steve Wong for contributing to this report. Finishing equal first in the High School Championship section gave John Bapst Memorial High School an unprecedented four straight state high school championship wins (2005, 2006, 2007 and now 2008). The Bapst team (in board order) consisted of: Fritz Eyerer, Aaron Spencer, Zach Smith, Margaret Bryan and Kurt Eyerer. Bangor High School returned to the championship winners circle (they won their last state title in 2003) with (in board order) Henry Chai, Andrew Audibert, Keji Xu, Scott Dennis and Mitchell Jameson. Maranatha Home School Fellowship and Orono High School both scored 9.0 points to share first in the High School Reserve section. Top scorers for Maranatha were: Hoty Briggs (4.0), Nathaniel Simpson (3.0) and Ezra Briggs (3.0). Top scorers for Orono (all scoring 3.0 points) were: John Robinson, Avery Cole and Nigel Kass. In the High School Novice section, Piscataquis took first with 8.0 points followed by Deer Isle - Stonington with 7.0 points. The high scorer in this section was Jake Schmidt with 4.0 from Deer Isle - Stonington. Scoring 3.0 points were: Julia Shaffer and Tyler Toby both from Piscataquis and Stephen Foster-Weed from Deer Isle - Stonington. The Junior High School section was won by Cape Elizabeth Middle School by the smallest of margins. Cape Elizabeth scored 16.5 points just edging out the Deer Isle - Stonington team that scored 16.0 points to take second place. Top scorers for Cape Elizabeth were: Brett Parker (4.0), Peter Campbell (3.5), Robert Freccero (3.0), Ethan Dininno (3.0) and Daniel Epstein (3.0). Top scorers for Deer Isle - Stonington were: Sam Grindle (4.0), Nick Eaton (3.0), Connor Morey (3.0), Chelsea Brown (3.0) and Hayden Ciomei (3.0). The Elementary and Junior High School Novice sections were both won by the Toddy Pond School. Piscataquis took second in the Junior High Novice and Bucksport, Piscataquis and Veazie tied for second in the Elementary Novice. Top scorers in the Junior High were: Hila Shooter (Toddy Pond) and Megan Weeks (Piscataquis). Top scorers in the Elementary were: Corey Shooter (Toddy Pond), Dexter Canning (independent) and Cameron Jack (Tody Pond). Cape Elizabeth also topped the Elementary (K-6) crosstable with 16.5 ponits--coincidentally the same score as their Junior High School championship team. Airline Community School finished second scoring 14.5 points. Top scorers for Cape Elizabeth were: Wesley Parker (4.0), Daniel Brett (3.5), Matthew Fishbein (3.0), Jack Demeter (3.0) and Colin Smith (3.0). Top scorers for Airline were: Laddy DeLuca Lowell (3.0), Isaiah Massey (3.0), Laura Whitney (3.0), Haley DeLuca Lowell (3.0) and Anna Bryan (2.5). Deer Isle - Stonington scored 10.0 points to take first in the Primary (K-3) section. Airline Community School, having won the last two (2006 and 2007) K-3 state titles, had to settle for second with 7.0 points. Top scorers for Deer Isle - Stonington were: Bethany Humphrey (4.0), Soozin Cha (3.0) and Kinsey Bartlett (3.0). Top scorers for Airline were Max DeLuca Lowell (3.0), Zachary Grindal (2.0) and Oliver Sheehan (2.0). Hampden Academy (left) battles Bangor High School in the High School Championship section. Thorton Academy (left) gave John Bapst a run for their money in round one. Bapst won this round by the razor thin margin 3.0 - 2.0. John Bapst (left) plays Cheverus High School in round two. Aaron Spencer asking Fritz what it thinks of his previous game. Brandon Greaton (left) considers his position in his game vs. Miriam Nielsen during the Cheverus (right) vs. Thornton Academy match. Ian Pellitier and Goldie Garcia representing Deer Isle - Stonington High School. Hampden Academy coach Ben Johnson replays the moves of Tao Mason's game. High School Championship tournament director Phil Lowell pores over the results. Andrew Audibert (Bangor) on his way to beating Bapst's board two Aaron Spencer in the championship round. This game put Bangor up 1-0. Zach Smith (John Bapst) won his last round game vs. Bangor's Keji Xu. This leveled the score: Bapst 1 - Bangor 1. Scott Dennis (Bangor) lost his game vs. Margaret Bryan: Bapst 2 - Bangor 1. This one was the barn burner. Kurt Eyerer (John Bapst) makes a move in his critical game vs. Mitchell Jameson (Bangor). ...after sidestepping with his king, rather than capturing the skewering bishop on g8 with the mundane 3...Rxg8, Jameson played the stunning 3...c2! !--fearless chess! Then after 4. Rxb2 c1=Q+ black captured the rook on b2 and went on to win this remarkable game. Kurt Eyerer shakes hands with Mitchell Jameson: Bapst 2 - Bangor 2. The final position of the clock in Eyerer - Jameson game. With the score now 2 -2 attention quickly turned to the last game of the match: Fritz Eyerer (left) vs. Henry Chai. The game was already deep into the endgame and after a few more moves the players agreed to a draw in this the final position of the match: Bapst 2.5 - Bangor 2.5. State Champions John Bapst Memorial High School (left to right): Aaron Spencer, Fritz Eyerer, Kurt Eyerer, Zach Smith and Margaret Bryan. The John Bapst Chess Team is coached by Bob Solinger. State Champions Bangor High School (left to right): Andrew Audibert, Henry Chai, Mitchell Jameson, Keji Xu and Scott Dennis. The Bangor High School Chess Team is coached by Jon Dearing. Omar Khan (left) plays Nathaniel Simpson in the High School Reserve section. The start of the final round in the High School Reserve section (clockwise from left): Nathaniel Simpson (Maranatha), Ezra Brigga (Maranatha), John Robinson (Orono), Hoty Briggs (Maranatha), John Soong (South Portland) and Nigel Kass (Orono). Maranatha Homeschool Fellowship shared first place in the High School Reserve section (left to right): Nathaniel Simpson, Ezra Briggs and Hoty Briggs with Orono High School's reserve team John Robinson, Avery Cole, Nigel Kass and Sorel Edes. Tournament director Alba Briggs looks over the High School Novice section won by Piscataquis with 8.0 points followed by Deer Isle - Stonington with 7.0 points. ...Deer Isle - Stonington's Sam Grindle. Sabrina Fadillah playing for Orono Middle School. Jessica Chen vs. Alex Silva in the Junior High School Championship section. Deer Isle - Stonington power! Janelle Ciomei (left) and Emily Cormier. Peter Campbell scored 3.5 points for Cape Elizabeth in the K-8 Championship section. Airline Community School's own and GameKnot.com correspondence chess junkie Tom Deckers. The Cape Elizabeth Junior High School championship team (back row left to right): Ethan Dininno, Peter Campbell, Anthony Freccero, Brett Parker, Daniel Epstein (front row left to right): Alex Silva, Shannon Daly and Coach Mark Parker. Top boards begin the last round in the K-6 Championship section: (clockwise from left) Anna Bryan (Airline Community School), George Spahn (Palermo), Matthew Fishbein (Cape Elizabeth) and Wesley Parker (Cape Elizabeth). John Xiang made the trip up from Scarborough. An important detail not to be overlooked: marking the results on the pairing sheet. Cape Elizabeth coach Dan Fishbein takes an interest in the K-6 results. Wesley Parker scored 4.0 in the K-6 Championship section. Laddy DeLuca Lowell of the Airline Community School received the top female scorer trophy in the K-6 Championship section. With 3.0 points she was tied with Laura Whitney and Haley DeLuca Lowell both Airline students as well. The Cape Elizabeth K-6 Championship team (back row left to right): Will Krieger, Wesley Parker, Matthew Fishbein, Colin Smith, Jack Demeter, Danny Brett, Coach Dan Fishbein (front row left to right): John Xiang (Scarborough), Leo Wing, Nick Shedd and Ethan Duperre. Katia Dermott of Toddy Pond School plays Harrison Dieuvieul of Veazie in the K-6 Novice section. Cori Shooter on the move in the K-6 Novice section. Veazie coach Cullen Edes gives his students a few pointers after their games. Tom Sandford directed the Junior High School and K-6 Novice sections. Toddy Pond winners in the Junior High School and K-6 Novice sections (left to right): Hila Shooter, Katia Dermott, Cameron Jack, James Wilkinson, Daniel Weiss, Cori Shooter and coach Seth Yentes. 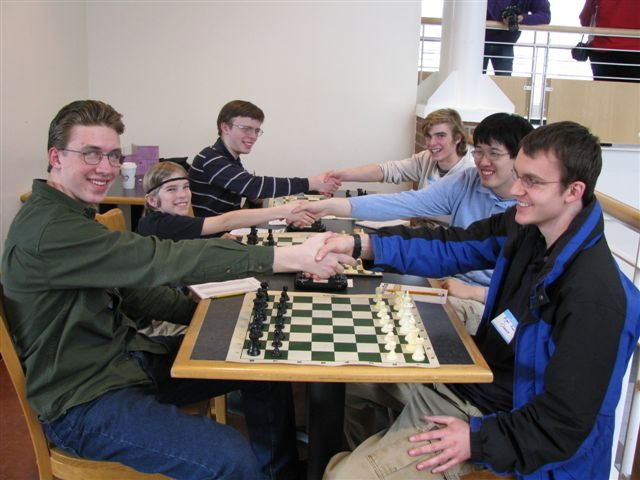 On average boys outnumber girls in chess by a 9 to 1 margin. In the K-3 Championship section there were six girls out of a total of fourteen players including Deer Isle - Stonington players Bethany Humphrey (left) and Soozin Cha--that's 43 percent! Max DeLuca Lowell (left) and Oliver Sheehan led Airline Community School to a second place finish in the K-3 Championship section. Steve Wong directed the K-3, K-6 and K-8 Championship sections as well as the High School Reserve section. K-3 Champions Deer Isle - Stonington (left to right): Mason Oliver, Ethan Shepard, Kinsey Bartlett, Soozin Cha and Bethany Humphrey. One more time with the two missing girls (front row from left): Caitlyn Morey and Kylee Atwood. Many teams travelled under cover of darkness in the early morning hours and in snow to make it to the tournament. Much thanks to all the organizers of this tournament, tournament directors, tournament leaders, The University of Maine, Orono, coaches, parents and of course the players. I enjoyed looking at your pictures. Thank you for all of the time you put in to help support kid's chess. As always Dan, nice photos and write up.